Brightline (soon to be Virgin Trains) is in talks to build station in both Tampa and Walt Disney World. A prospectus issued this month for their IPO shows both potential stops. Disney and Brightline have not commented on the possible Disney World station, Orlando’s WFTV reported. FDOT has approved negotiations on a lease for a Disney station on I-4, according to WPLG. The Orlando to Tampa route is expected to begin service in 2021, with top speeds of 125 miles per hour. The Florida Department of Transportation announced Wednesday that they had awarded Brightline the right to negotiate a lease on the Orlando to Tampa route. Brightline told investors they expect ticket prices on that route to average $35 for a one way seat. Miami to Orlando is expected to average $100 for a one way seat. $100 per seat from Miami to Orlando seems really pricey for a one-way ticket since it’s much cheaper to drive and even fly sometimes, round-trip for $100 is more reasonable. Some people don’t want to put up with traffic and some people are afraid of flying. Plus, the article states “expected to average,” which means it’s not exact yet. Fair enough, but at an average $100 cost they’ll have empty trains it just doesn’t add up especially for a family of four going to Disney to get ripped-off buying $12 turkey legs. So you think Virgin will not have special fare packages for families going to Disney World? There is no way that I am paying $800 for my wife and two teenage kids for a round trip ticket from Miami to Disney. Give me a break! My wife and I make close to $400K per year and still we would not pay $800 just to get to and from Disney, that is just crazy! Yeah.. wants to brag about his and his wife’s income but admits how frugal they are. I am not bragging, just stating a fact, and no we are not frugal, just not crazy enough to pay $800 for a trip to Orlando. The point is who is Virgin trying to target to – the super rich? $100 one way is simply ridiculous! Well why bring up the subject of how much money you and your old lady make dumbass? You can pay what Virgin is asking but you don’t want to.. so what’s the point in telling everybody? Yeah wow wee, we’re very impressed. LOL, jealous much dude? The guy has money and you don’t. He doesn’t want to pay Virgin and you can’t afford it. Both of you are losers! I bet you look as stupid as sound. Oh, got it your point was the train is overpriced and not that you and your old lady make $400 per year. European tourists don’t have the automobile psychotic dependency America have. yea the difference is that you pay 25 Euros in Europe to travel the same distance from MIA to MCO. So….its easy to say that Europe is not car dependent because rail is subsidized by the Gov and driving is heavly taxed. Unlike in the US where driving is heavily subsidized by the Gov. and rail receives little to no help. This. You can do Roma-Milano in under 3 hours and under €40 each way. That is normally a 6 hour drive, and the train actually takes you into the city center (not the airport in the suburbs like the Orlando station). Brightline is offering much less of a time savings when compared to driving, isn’t taking you into the city center, and is charging more. Orlando does have a city center, downtown Orlando. LOL @ expecting people here to know anything about Florida north of the Aventura Mall. Was in Orlando last month and spent the day in downtown (Church Street area). It’s a very small downtown with not a lot going on, but it is better than it used to be. Still no match for Miami. BS. I did Milano-Firenze last summer 75 Euros. I’d rather drive than pay $100 going one way to Orlando! Gee, aren’t you glad you have choices? Bright line should connect from Tallahassee to Key West in the future ….. that will be a win win for all the residents of this state……. Its imperative that they have group fares, if they dont it will fail miserably or just rely on tourist to stay alive. I’ve been saying the same thing. They offer group fares in Europe. A few people traveling together would obviously choose to money together and drive. booooo the mega bus already does this for a $1. Can we get a Miami to Jax train in 2.5 and Miami to Atl in 4 hours train. I honestly hoped after they got up and running they would speed them up a little bit to slice the drives in half. Yeah, just take your money and build one. Do they mean 100 pesos? They need to rethink that price ; my car an suv can go to Miami to Kissimmee in half a tank, costing right now about $30, this can be done with or without tolls of taking turnpike or i95. Who’s paying for the Orlando Airport station boondoggle if Disney station comes to fruition? The airport station is already built. A Disney station would likely be paid for by Disney and Brightline. I could imagine that not all trains go to disney or tampa and those stations may only have four arrivals a day. over time they should start eliminating the at-grade crossings with the intent of increasing speeds along corridors that are not suitable for 100+ mph travel. This is only way theyre going to be able to sway the balance in terms of (local) ridership when compared to car or air travel. Otherwise this will only cater to tourists that dont wish to drive. If the train could make the Miami – Orlando leg in 1.5 hrs (140 mph avg speed roughly), you can comfortably spend the whole day at the park and come back the same day (and save money on hotels and other activities associated with an overnight stay). I live in Vero Beach and am very concerned about a train going that fast through the heart of my town. (And I read this will happen up to 35 times daily!) This train will be a convenience to those in southern Florida and Orlando (and in the future, Tampa) – but in places like Stuart and Vero Beach and Sebastian, it will be a nuisance. It’s a shame the tracks couldn’t be moved further inland. I also read that Brightline dangled the opportunity for a new stop, and Vero Beach (and Stuart and Sebastian) not only turned down the RFP, but also put another $1m into continuing litigation against the project. (Which I believe is money wasted, since they won’t win.) Even though I’m generally against the train, it’s going to be built and there’s nothing that can be done now to stop it, so we should have at least tried to get a stop. I wonder if Fort Pierce will end up getting the extra stop, or if this new part of the project will even happen. Of course, with an extra Fort Pierce stop, the less likely the train will go 140 mph, so there’s a trade-off. With Tampa it only becomes more ridiculous not to take shortcut across state vs going so far north to make a hard turn then backtrack. Yes, Naples!! Now there’s an important hub! 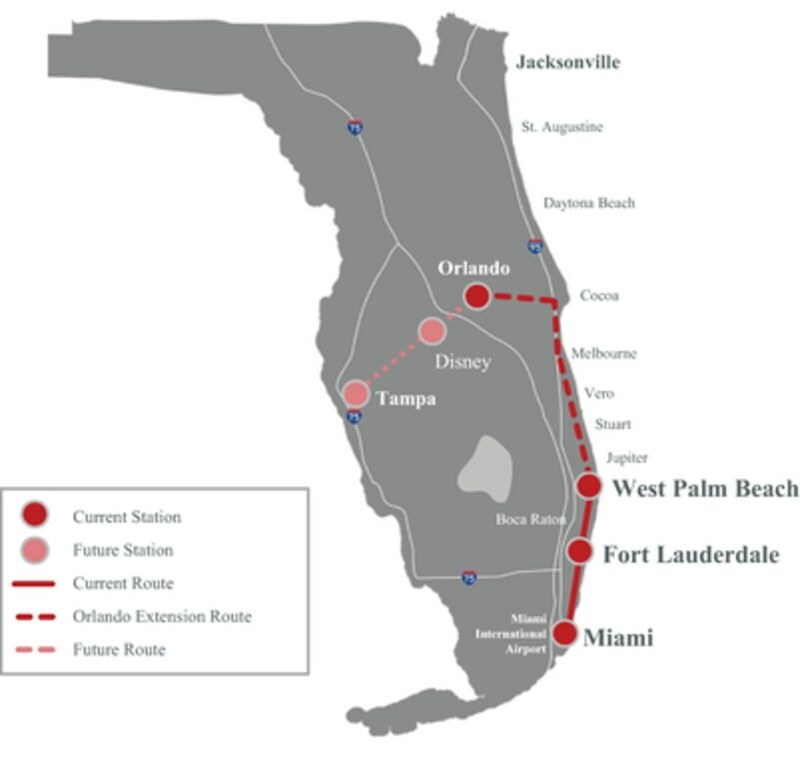 Fort Lauderdale-Naples would be the first or last phase of a loop with Orlando-Tampa connected with stations for Sarasota and Fort Myers. Assuming you’re going from one end of the system to the other but that’s not what Brightline is really setup for. Individually, Tampa – Orlando and Orlando – Miami are two very highly-traveled routes. That’s where Brightline sees the profit potential. There’s far less travel between Miami and Tampa — probably not enough to justify all the costs associated with setting up a rail line let alone the logistics of having to do that through environmentally sensitive areas. The I-95 corridor is the most populated region in the state. Eventually, Brightline (or now Virgin) trains will continue traveling the I-95 corridor from Miami all the way up to Jacksonville and back with a spur to Orlando and Tampa. Tampa and Orlando are MUCH more densely populated than the I-95 corridor that’s north of south Florida. The stretch from just WPB to Homestead is still way more populated than the (nearly equidistant) stretch from St Pete to Orl. Doesn’t matter that the rest is desolate. Not true even tho Polk county isn’t built up it host some of the largest population in the state which is in between Tampa Orlando and brightline will have stops there. This region is set to become one of the most populated areas in the US! 125MPH is too slow, would be significantly quicker by plane (700MPH) or even by car after taking into account all the stops and pedestrian crossings. The bullet train clocks in around 375MPH, and that technology was developed over 20 years ago. At $100 a ticket, the price point is great for consumers, maybe even a little too low. After gas and tolls, you’re looking at $100, easy. Would also like to see stops at either Daytona or Okeechobee, as those are underserved markets and en route to Orlando. You really think $400 for you and your significant other to go to Orlando and back is low? Let me guess, you also think $5 for a coffee is a good deal too. Everything about this comment is moronic. In what world, using what car do you pay $100 or even CLOSE to in it gas/tolls to get to Orl? I have a small gasoline car I pay about one fillup ($25 for my car at todays’ prices) and about $12 in tolls, one way. That’s a $63 savings (times 2) vs this train for a day trip!! I like the train too bud, I was cheering on it’s building and I still will. But there’s no need to grossly overstate things that aren’t true. It just gives the detractors more ammo. Miami to Orlando is about 236 miles. I get about 20 mph on the highway. That’s about 24 gallons. At $2.65 per gallon, …it’s $62.50 round-trip in gas, about $45 round trip in tolls. $24 in parking for a couple days. If solo on a business trip, I’d rather take the train. If with family (like my last trip to Disney with 6 ppl) i’ll load up the SUV. Brightline isnt for everybody, all the time, but is certainly a great alternative. Thank you.. that’s what some people who come on this site don’t understand, “Brightline is an alternative.” With the train, you don’t have worry about leaving Miami at a certain time to avoid rush hour traffic. You don’t have to concentrate on the road the entire time when you’re driving. You just sit back in air conditioned comfort, enjoy the music, and let the train take your driving cares away. Let’s assume your math is correct on a business trip 62.50 + 45 + 24 = 131.50 at $200 round trip on Brightline you are already down almost $70 bucks. What you did not include is how much it will cost you to get around once you are there, something that would not be an issue if you had your car there, last time I checked Uber/Lyft were not free. You can do all the calculations you want (most are wrong, btw) but it appears that NONE of you value your time. I can work with high speed WiFi on the Brightline, if you’re driving, you can’t. I bill at $100 per hour, the ticket pays for itself. Food for thought. And there you go everyone. We have found the one guy who Virgin is catering to, so if you too are billing at $100 per hour this train ride is for you! Just say this is a better option for the Rich than the common joe and Keep it moving we actually have bills. And need all funds we get. Sorry a trip to MCO doesn’t jus pay for it self. At least not for me!